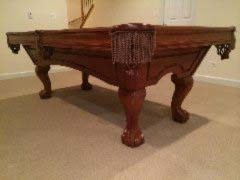 This 10’ Brunswick-Balke-Collender Centennial Carom table represents one of the finest carom tables money can buy! 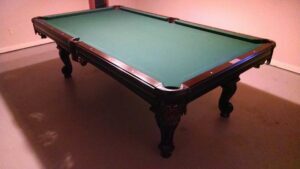 Just like it’s sister table (the pocket billiard version of the Centennial), the Centennial carom table combines traditional dark woods with a modern aluminium design for a strikingly handsome appearance that is sure to fit nicely into any existing game room decor. The all-hardwood base frame consists of two side rails, two end rails, and two cross stretchers, which provide perfectly leveled support for the slate bed, allowing for a true and accurate roll. 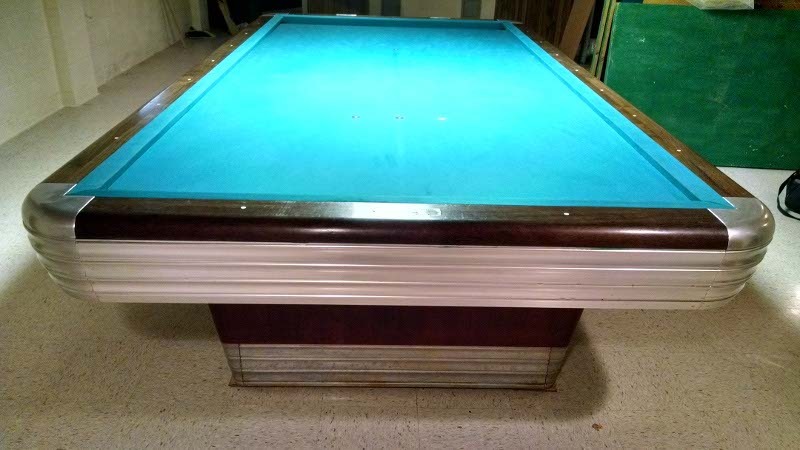 3 piece 1” slate is used on this Brunswick carom table, and it is drilled precisely for rail bolts and secured to the frame by concealed screws. The aprons, which are securely attached to the rail and base frame, also feature the grooved aluminium contour just like the leg bands and corner castings. 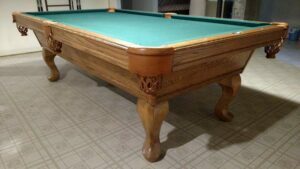 Moreover, the Centennial carom table features a new, massive rail which is said to completely remove vibration and significantly improve accuracy. 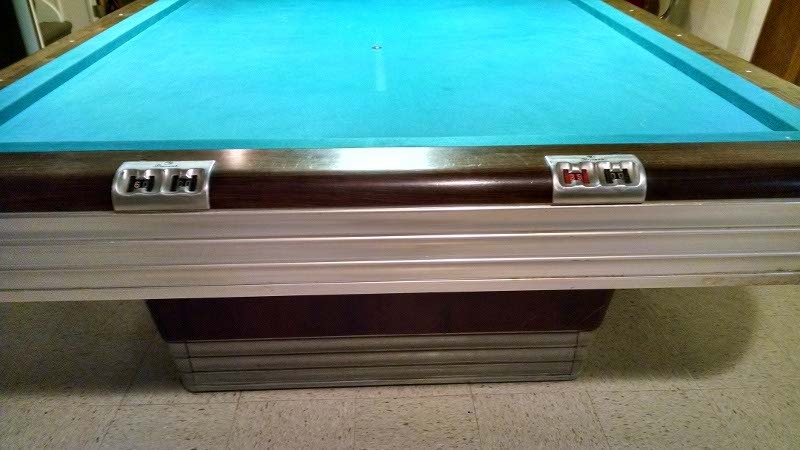 Brunswick cushions with impeccable resiliency are fitted onto the rails, and the tops of the rails are garnished with Mother of Pearl sights at even intervals. All of this rests on two sturdy, oval-shaped legs which are tapered at the base, finished with a rich Rosewood, and enveloped in mar-resistant aluminum to match the aprons and corner castings. 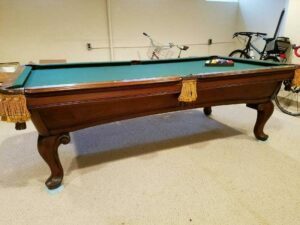 Overall, the Brunswick-Balke-Collender carom table represents strength, rigidity, and traditional elegance and would be a great addition to your commercial or residential gameroom! 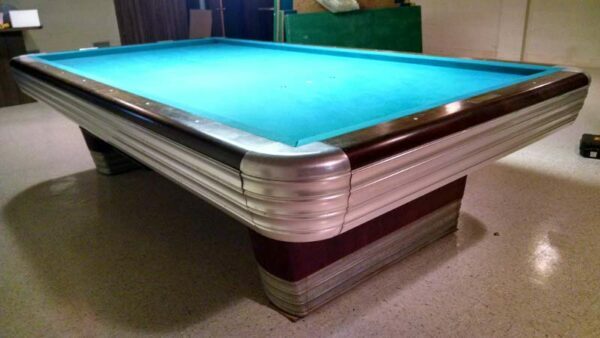 Call us today for more information on this, or any of our other carom or pocket billiard tables!